A man withdraws 60 Euros, the maximum amount allowed after the imposed capital controls in Greek banks, at a National Bank of Greece ATM in Piraeus port near Athens, Greece, June 30, 2015. Greece is officially in default after missing a $1.8 billion loan payment Tuesday to the International Monetary Fund. It is the first major developed economy to miss such a payment. European finance ministers decided Tuesday against extending a bailout program for Greece that would have enabled it to meet its obligation to its creditors. The ministers plan to hold more talks Wednesday, but Dutch Finance Minister Jeroen Dijsselbloem said that "it would be crazy to extend the program." Greece's next hope would be for the IMF to agree to a Greek request to extend the loan. Athens also said it could cancel Sunday's referendum on whether Greeks should agree to more economic reforms and spending cuts in exchange for new loans if creditors agreed to open new talks. A Greek default could mean Greece would leave the eurozone, shaking up European markets. Greece has amassed a huge debt over the last five years. But the government is balking at demands from the EU for more economic austerity. Greece said its citizens have suffered enough with spending cuts and tax hikes that have lowered their standard of living. Greek banks remained shut Tuesday, and its stock market closed. While the country's economic future remained uncertain, the Greek finance ministry said it would open about 1,000 bank branches across the country to allow pensioners, many of whom do not have ATM cards, to withdraw enough money to get through the week. Protestors displaying a banner bearing the ''NO'' slogan in reference to the upcoming referendum on bailout conditions, during a demonstration in front of the Greek parliament in Athens, June 29 and pro-euro protesters hold a banner reading ''YES" during demonstrations in the same location, June 30, 2015. In Washington, President Barack Obama said the Greek financial crisis was "an issue of substantial concern," but more for Europe than the United States. Obama said the U.S. did not expect the financial turmoil would result in "a major shock" to the American economy, the world's largest. Greece and its creditors have engaged in contentious negotiations for weeks, with talks ending last weekend when Prime Minister Alexis Tsipras announced his plan to hold the referendum on whether to accept the creditors' latest austerity demands in exchange for new loans. Tsipras urged a "no" vote, although European leaders said that would amount to Greece withdrawing from the eurozone and politically divorcing itself from Europe. Tsipras said Monday that he would respect the outcome of the referendum, but he cautioned that his far-left government would not be the one to carry out the new austerity measures. 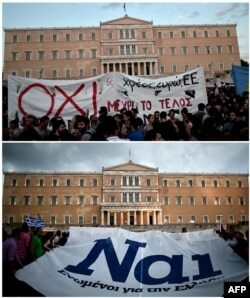 While Tsipras spoke on national television late Monday, anti-austerity protesters marched in Athens. World markets tumbled Monday but were mixed on Tuesday. European exchanges continued to fall, while stocks advanced in Asia and the United States. 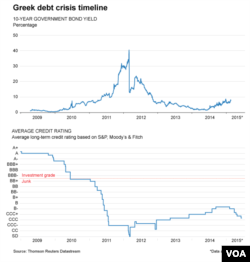 As the Greek financial drama unfolded, the Standard & Poor's financial services company on Monday cut Greece's credit rating further into "junk" status. It also said there was a 50 percent chance the country would become the first to exit the eurozone in the 16-year history of the currency. On Tuesday, Spanish Prime Minister Mariano Rajoy said the most damaging aspect of a Greek exit from the euro would be the cloud of doubt it would cast over the irreversibility of the currency. Interviewed on Spain's COPE radio, Rajoy said that in the event of a Greek exit, people could think that "maybe another country could abandon it in the future. I think that would be the most serious problem that this could generate." Rajoy said a Greek exit would not be the best news for either Greece or Europe "but Europe would continue with the euro." The Kremlin brushed off speculation Tuesday that it could lend money to Greece, despite Tsipras having visited Russia twice since April. However, Turkish Prime Minister Ahmet Davutoglu said Ankara was "ready to help" Greece out of its escalating financial crisis as its embattled neighbor edged closer to default. "We are ready to help Greece survive its economic crisis with cooperation in tourism, energy, trade," Davutoglu told the French news agency AFP Tuesday. "We want Greece to be strong. ... Therefore Turkey will be positive toward any proposal for cooperation," he said in televised comments. Davutoglu added that a Turkish delegation would travel to Greece for a high-level cooperation meeting as soon as possible to consider joint steps on the financial crisis. European Union chief executive Jean-Claude Juncker and British Prime Minister David Cameron both warned Monday that a Greek vote against the new austerity steps would mean that Greece wants to divorce itself politically from Europe. Greece woke up to closed banks and empty ATMs Monday.